Undoubtedly, if you are thinking about opening a fashion clothing store, then you must be into fashion. But who isn’t? Everybody is into fashion. It is the individual taste in fashion that differs from person to person. Anywhere you go, fashion clothing stores are always making brisk business. That is also precisely the reason why a fashion clothing store needs to have an edge over its competitions. There are just too many fashion clothing stores out there. Most successful fashion clothing stores have a few things in common: competitive prices, a great selection of clothes and accessories, attractive packaging (marketing) and yes, a catchy name / brand / tag. Thinking of a name for your business is a tricky endeavor. You obviously want your patrons to remember your store, but you also want them to associate the name of the store with your merchandise. Before you open your own fashion clothing store or fashion boutique, you may want to think about what “theme” or specialization of clothes you may want to sell. There are a lot, a few examples include: bridal or wedding boutique, business clothing boutique, casual wear / rough gear / street clothes, children’s wear boutique, couture, formal wear boutique, lingerie, maternity store, men’s wear boutique, special size boutiques (petites, plus size, tall, etc.,) sports wear / active wear, teen gear, women’s wear boutique, etc. You may also want to consider if you want to sell accessories, hats, belts and shoes in your fashion clothing store. Because you are the owner of the store, your creative prowess will constantly be challenged when you present the public your wares. Attention to detail in window presentation, store lighting, rack displays and even that touch of personal service will all come into account when you open your fashion clothing store. 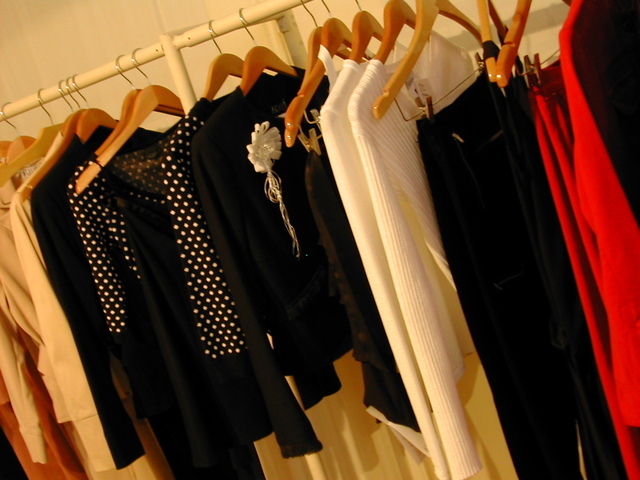 There are two kinds of fashion clothing stores: retail fashion store and fashion boutique. Retail fashion specializes in selling new clothing products created by fashion designers which may (or may not) be dictated by celebrity trends. Some retail fashion stores have gone to such specialized extent that they only offer the works of their in-house designers. Others have a number of brand names and designer names offered in one roof. Fashion boutiques, on the other hand, are more (for lack of a better term) chic or upscale. Personalized service, cozy ambience and unique merchandise are offered here – and patrons of such places usually expect nothing less. Another huge factor about launching your own fashion clothing store is your business location. Malls are popular places for such stores, but they do come with steep rents, and a lot of competition. Stores that sell outside such establishments may have less overhead expenses but may also have less foot traffic. Your prospective market may also be an important element in choosing your business location. For example, teens frequent malls, and thereby is a great place to sell your line of teen wear and accessories. Couture clothing lines or vintage couture may not fare as well in the mall, but rather in some cozy niche in a chic part of town. Pricing is important, as with the quality of the merchandise. Some clothing stores manage to pull off slightly higher pricing from its peers, but only because they have already established their brand names in the market. Since you are only starting or launching this business, you may want to refer to popular prices among your competitors. The quality of your merchandise should also be a great concern to you. Nothing will lose you more customers faster than poorly made clothes passed off as “fashionable” wear with very dear price tags. Customer service is also a factor in most shops. Chic boutiques make this a top priority, even offering coffee or tea to its patrons. However, if you prefer a retail fashion store set-up, remember to keep a friendly atmosphere in your shop. It will encourage your potential customers to ask for your advice on fashion trends, or gift suggestions and even a whole fashion ensemble – which may mark you a returning customer or greater sales. Another matter to consider is the safety of your store and merchandise. If you notice most, if not all fashion clothing stores have security measures against theft and break-ins. Some of them may go as sophisticated as a 24 hour video surveillance system. Others rely on tag systems. Check your budget first or your overhead expenditure rates as to what kind of security measures you may need and / or afford. Starting a fashion institute can be a great way to make money. If you have the right knowledge, experience, and skills, create a plan of action. Are you thinking of starting a fashion line? If you are, there are so many things that you have to attend to. Start with a business plan and work your way up. Would it be possible for an entrepreneur down here in Kenya to work out a franchise business with fashion designers/retailers abroad? can i create a online store to sell my music cloth from jamaica? i am interested in clothes retail franchise to operate in Zimbabwe, would you know of any franchisers? i think its good to be an entrepreneur but its hard work. i want to know how much it will cost to start a clothing and shoe business? This has helped me in defining the words of a web page for a Ladies Boutique-Store client. I'm a writer in English, based in India & offering linguistic services for foreign clients, many of whom are not conversant with English. Looking into sourcing for clothes supplier. If anyone is interested in selling their clothes, do email me on your products. Thanks! Hi Dennis, If you are interested in designer women's garments, i could be of help...what are your requirements? It was great help in future businesses, is there any requirements we should have... to start a fashion retailer store? I'm interested in opening my own plus size fashion store it would be more like a retail environment. I have excellent customer service experience, and i feel like i'm wasting my talents, making others money. I'm interested in starting a boutique that specialize in woman's shorts, capries, jeans and nice tops. How will I go about getting in touch with the right people that can sell me wholesale clothing of that particular style. Interested in opening up clothes store in Rwanda- Kigali but i wonder how to start .... i need help. I can't sleep thinking of the store. i want to open my own bridal store in zambia. i have diploma in fashion. i am visiting the country in january to do some research. will the bank give me a loan? i mainly want to know about pricing. all in all how much money do i need to start my own business? I'm interested in starting a ladies clothing store specialized in nice tops, nice jeans and fab accessories with a little bit of work wear but with a very modern twist. ( some kind of ZARA or MNG concept)I would like to Know some wholesalers name and how much money should be my first inventory to a small-medium space? @Alfrida, What exactly you mean by "how to source for fabrics". Is that you want to know from where you can buy the cloths? I'm thinking of starting an online women's store for chic dresses in Kenya, Asia fashion. I've got a few you can look at from http://littleheartfashion.blogspot.com Anyone who has experience from the Asian wholesalers? I want to expand my suppliers. Great advice. I need your advice, I have a taste in fashion is it possible to design my own brand and supply them to the store that I want to open. I gonna use my double garage as production for sewing clothes. Please help me here. Hi, My name is Raman. I like to open indian clothing store in USA. I need to know all the tips, how much it would cost me to get deliveries from india, where i can get big stocks in low price? I'd like to open up a women's clothing store, similar to ZARA and H&M, in Kenya. Any tips would be greatly appreciated. Hi, I mainly manufacture and export handbag business in China, now i am planning to open stores selling handbags, accessories and clothing, i have my own brand and i take ZARA as my example, all tips will be much appreciated. thanks a lot. well i wanna open my own fashion brand in partnership with one of my friends. can i have some tips as to how much it will cost and some guidelines...?? Hi, I am a young lady hoping to set a fashion boutique up in vintage clothes for men, women and kids, I am also hoping to expand the website to a few brand names so customers get the best of both worlds, any with any ideas or useful info please get in touch. Suva, Fiji Islands. I'm interested in opening a woman's clothing store, need your advise in setting up the business... to start small. business location is Mooloolabah, Queensland - East/North Coast, Australia. this is a great site, it has directed me in the right direction. Thank you for your advise. I would like to start a saree boutique at my place and i would like to know the expenditure to start it and the suppliers of sarees, ghagras, kids ware, chudidars. I'm interested in starting a small boutique with low budget mainly exclusive imported Asian outfits, tops and fancy items in coimbatore, India. Please give me some idea how and where can I start? Kenyan living in mombasa city. never done this kind of stuff but pretty interested in the venture. Advice me as a green entrepreneur who knows nothing but excess admiration to that line of occupation. Be good. Regards joseph. Maldives, Male' am looking for an investor/partnership to start a fashion boutique in Maldives. Hi, I am very good at designing cloths, be it western or traditional wear. I can design and get stitch accordingly, can anyone guide me on how to sell or supply a boutique. I am from Hyderabad, India. hi! i m going to start my own asian clothing business online, someone is interested in buying the stock or if someone wants to buy clothes for oneself please do mail me. thx, jiakhan from leeds. england. prithi can u sell me few of your clothes stock please, if you are interested do contact me. am about to open one please help me with all the tips and advice u can give. To James, I am looking for fabrics i can use to create my own designs for children. Hi, I want to set a cotton boutique in bangalore. I want to find out which is the best place to buy cotton fabric and running materials and also handloom traditional dupattas and material. i want information about the places in INDIA where i can buy best material at the best low whole sale prize. Hello I am opening a ladies fashion shop in durban south africa. i am looking for good quality hippy/bohemian trendy clothing and accessories at wholesale from india. also looking for lakme cosmetics sarees and salwar. hi me and a friend are looking at opening a fashion shop in a small town in scotland where there is no where like it, but have not an idea on where to find suppliers? could you please give any tips on where we start ? hi I want to open a fashion shop in harare but the problem is I don't know who to approach so I can get a shop in harare...help me with tips. would like to start up a small scale women clothing store in the market area of Margao city of Goa, India. guide me with all the tips on how to go about it right from the start. Hi prithi, I would like to see your designs. Can u please contact me. hi, i am interested in doing ready made business like jeans & t-shirts in warangal. so i need the info where to get them. For selling which place i've to adopt in the main center or sideby, capital. Edmonton, Canada. I am planning to open up a home business on kurtis, sareees, salwar, churidhar. Any tips, sales lead appreciated. I am opening a boutique in Ezulwini Swaziland in Southern Africa, and would need manufactures I can import young , chic clothing from. To open a fashion store has a lot of aspect need to consider, place of the store, decide if street or shopping mall, check the around competence offers, designs, prices and sales value estimate. Check what they offer and with what price and then offer better and more beautiful similar products, with better prices. Talking about business is what will make your store successful, never think romantic ideas about offer your own designs or taste and believe people will like and buy no matter the price and so on. We are Spain fashion company with factory and stores in China, one of the most difficult countries in a matter of direct sales, and we are successful thanks to our way to work. I think in any country is the same, after all, one store reply to the demand of 1000 sqm population, it is so small quantity of potential customers, so is important to study them, different areas have different numbers, for example if your store is similar to H&M clothes, you have to find a place very busy every day, if near to university better, spend big money in decoration, and put beautiful and innovative designs with prices never over 20Euro, seems impossible but if you contact with me I will tell you how. I am a supplier of quality mens' formal wear such as formal suits, shirts, tie sets and trousers. I am based in South Africa and need buyers from outside the country. I need to get about 100 dresses made for my clothing business. Can anyone tell me where to start looking in Shenzhen, China for a tailor or factory to produce this small amount. I am a clothes supplier in Cambodia and we ship worldwide to our buyers. We have our own designers, dress makers, and we can cut and sew anything your fashion business need. We have many pattern of silk and fabric to make men shirts, women wedding and evening gowns, children clothes, handmade jewelry, arts, etc. We design them by hands and made ourselves and importantly our products help benefit the poor. If you need our sample we show you. There is no minimum for our orders. Please contact me at sapphirise@yahoo.com. I want to start a small retail outlet, men / woman wear plus kids stuff, location Goa, have a 1300sqft place, want to utilize it. where can i buy good stuff, so that common man can afford buying. Is there anyone who can offer good stuff, kindly contact me sarf_99@hotmail.com. hey i would like to put up exhibition in my city (mumbai).. i am interested in retail.. would like to buy stuff in wholesale and put them up here.. wanted to know how much does it cost to start it and what all should i keep in mind while doing it. Thanks. Hey, I am looking to open a urban/streetwear clothing store here in Barbados. I would love some info on where to get these clothing styles at wholesale prices. Also, I have some ideas about what I would like the store to look like but I have some issues executing these ideas...I guess a designer could help me in that area, but I would love to hear back from you. Thanks! i want to open a fashion store in hyderabad and i have a limited budget so can u please let me know how many peaces u can supply at a time n there prices. i want 2 c ur stuff so how can i? Hello! I want to start a business of selling quality brand secondhand leather shoes and handbags. After some asking around people have suggested buying from Mozambique or Kenya. I am based in Botswana and there is a flight from Gaborone to Nairobi which makes things easy for me. I am looking for the names of the suppliers in Mombasa. Please someone assist with where to buy at Mombasa. I am in Dubai and i have access to good quality clothes i would like to supply boutiques in countries like Zambia, Malawi, DRC and Mozambique if you are interested please get in touch. We are growing designers from India and coming up with new trends/designs with a blending of Indo and Western Culture also with Traditional Indian and Embroided (all sort of embroideries) womenâ€™s Salwar Kameez Suits, Churidars. Our clothesline are bridal, formal and casual wear and the fabrics are Matka Silk, Khadi Silk, Tussar, Satin Crepe, Georgettes, Chiffons, Nets, Bandhani, Organza, Crush Tissue etc. We wish to explore our business and want to start export in other countries also and our unit is ready to work on order basis as well. Kindly guide me.